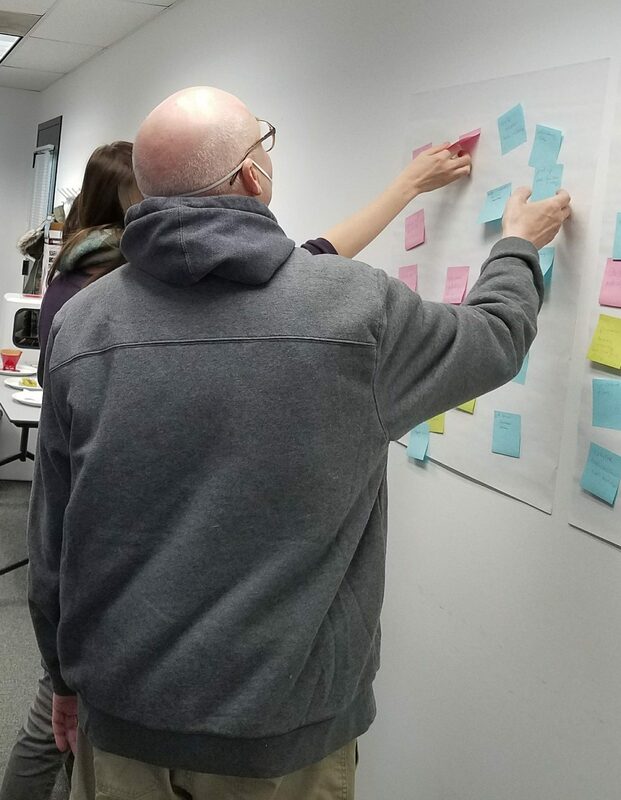 The User Services Department of the Paul V. Galvin Library at Illinois Institute of Technology has recently embarked on a Service Design project. This project focuses on enhancing the services provided at our circulation desk in order to meet the evolving needs of our users. A diverse team of library staff members and librarians were selected to work on this project and will be meeting throughout the year. In anticipation of our first meeting, we teamed up with the the new Continuous Improvement (CI) unit within the Office of Student Access, Success, & Diversity Initiatives (SASDI). The CI unit met with two members of the team ahead of time to learn about the project goals. Based on this information the CI unit developed a training session tailored to the needs of our group. We met on January 5th for a productive half-day visioning session. During this session, we were instructed to think about an imaginary library where we had the opportunity to design our services from scratch. This process allowed us to focus on the services and experiences that are most important to us and our students, rather than trying to reengineer processes without looking at the bigger picture. As a result, the group was able to identify the key service aspects that warrant the group’s focus. This was an important first step in our Service Design project. The CI unit was invaluable in walking the team through exercises that helped clarify our goals and next steps. We look forward to involving our users in the next steps of our project and will co-create recommendations for service innovations for fall implementation. Kimberly Shotick is the assistant dean for user services and outreach at the Paul V. Galvin Library. Katie Ediger is a user experience librarian at the Paul V. Galvin Library.